At Facebook, where we’re working to make the world more open and connected, an inherent part of our mission is to share how we create the things we build. We recently decided to begin sharing a critical part of our process as a result: the design critique. By showing how design critiques at Facebook typically go, we wanted to highlight what makes for a good critique and what can often get in the way. We asked designers around the world to collaborate with us on this, inviting them to share work to be critiqued using the hashtag #FacebookDesignCrit. A dozen of you shared your designs, and we’re ready to show how our first collaborative critique went. 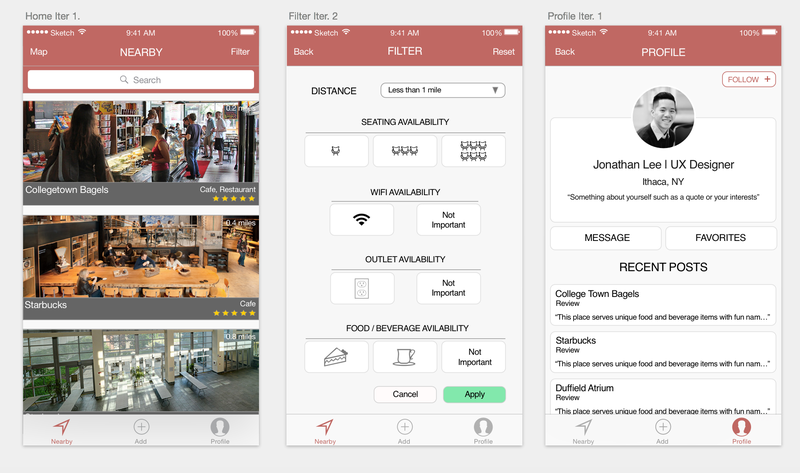 For this, we reached out to New York based design student Jon Lee to discuss his design for a local workspace discovery app called Nearspace. Six members of the Facebook design team — Nathan Garvie, Paola Mariselli, Jeff Smith, Jasmine Friedl, Geoff Teehan, and myself, Tanner Christensen, as facilitator — sat down (virtually) with Jon to discuss his project and critique the work. As you read, we would love to have you leave us comments on what you think went well during this critique and what could have been improved. Jump to the bottom of this post to read a few of our own highlight takeaways. Tanner: Jon, can you take a minute to quickly summarize the problem you’re solving? Jon: As a student I often ran into the problem of trying to find a place to do my work. With the limited spaces here and all the features I need to work remotely, it was often the case where I’d enter a Starbucks nearby or go to another place to study and it’s just very uncomfortable. 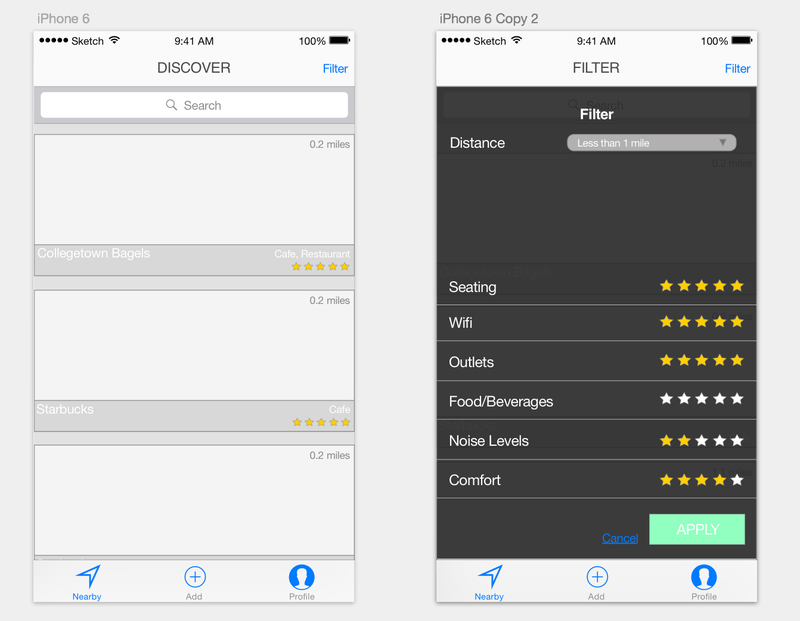 I figured, why not create an app that would help you find a place very quickly that could fit all your needs? …I interviewed another student and an instructor to see their perspectives…I gathered…key insights which highlighted the idea that the app seems to be good for people who are in new areas that aren’t familiar with their surroundings areas. Tanner: It looks like you made some good progress and did a bit of research. What specific part of this are you looking for feedback on? Jon: Specifically the high-fidelity end, because this is my first time ever designing anything [on my own]. One of my biggest concerns is that as I’m looking for internships in user experience, all the employers often ask for my portfolio and say “You know the process pretty well, but you’re lacking graphic design skills,” or “your visual experience just isn’t there.” That’s something I want to focus on today. Tanner: Before we do that, does everyone understand the problem that we’re looking at here and agree on what we’re solving for? Jasmine: Can I first ask a clarifying question? You talk about the problem being mostly students having a hard time finding places to work, was it just students you designed this for? 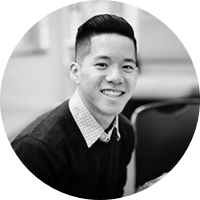 Jon: Initially it was just for students, but then I started thinking… one persona that caught my eye was the common business man or woman who’s just trying to get things done on the go. This is something I haven’t necessarily determined yet, whether or not my main focus would be just for students. Jasmine: I know you’re asking for feedback on the end result, but can we dig a bit more into the problem, making sure the end result is meeting the needs of that problem? I’m imagining if a person doesn’t have a work space, why is that a need? Is it something where working at home isn’t an option? They don’t have an office? They’re on the go, meeting clients? What are the characteristics of the problem? Jon: I think the biggest characteristic is the last thing you said: they’re on the go, trying to get things done quickly. They’re not necessarily looking for somewhere that they’re going to be staying at for long or go back to consecutively. The main issue is the idea that you’re already short on time and you need to get something done quickly. Tanner: It’s interesting that you’re talking about the emphasis being on something quick and efficient and also comfortable. 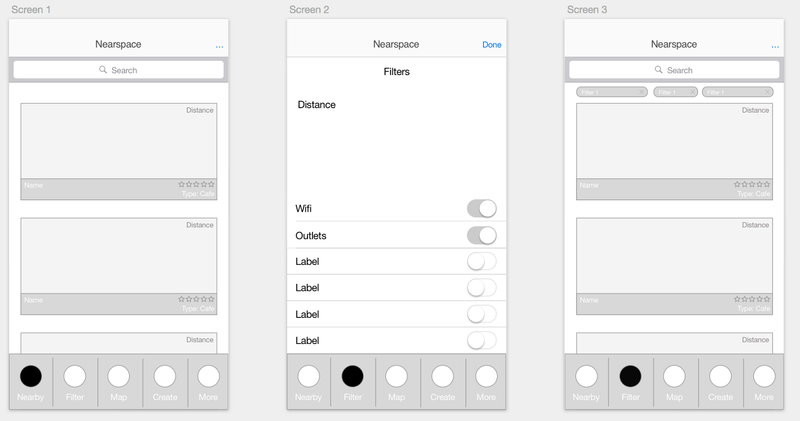 The core part of the app—looking at the screens now—isn’t necessarily about time efficiency or how close it is to you. Right now it’s more about the aesthetic and these filters. What led you to focus on this filtered design rather than something that’s more efficient for users? The difficulty I had was balancing efficiency with the user’s needs, right? A filtered view is still necessary, otherwise how are we going to determine a decisive system for what you’re looking for? It was definitely a struggle I had. Geoff: I think one thing you want to understand is are people actually going to add places? Are they not protective of their space since it’s limited? No one is incentivized to add a place if they’ve found their own, right? To share just means less likelihood that they’ll be room there in the future. So it’s one thing to be aware of that you may want to do more research on, how willing are people to share a space? Jon: That definitely was an issue that came up. I think the limiting factor in my entire design is simply the lack of research. I think that limitation itself has prevented me from addressing a lot of those problems. Jasmine: I think you do have a lot here that you could still use to make some assumptions and move on. Let’s go back to when we were talking about making a decision based on time. You have this brainstorm cloud here where you have a whole cluster of categories: you’ve got travel time, you’ve got public transportation, you’ve got distance. I could see you adding: do you have to wait in line here, are there open tables, things like that. Sometimes, even though you haven’t had time to dig in and talk to 20 people, you still have a good guess as to what you could move on. Jon: So you’re saying rather than having filters that are more general focused, to focus on filters related to the time decision? Things like is there a waiting time in line? Jasmine: I think what Tanner had zeroed in on is that if your goal is solving for people—both students and the regular working force, who don’t have a lot of time—the app you’ve shown isn’t really highlighting that problem. We’re talking about limitations on research and how it’s hard, especially for being a school project, to get to an end result that is verified and validated. If you looked at your problem and said: “Which of these ideas address the problem?” I think you can answer that through what you’ve already explored. Nathan: One thing I’d challenge you to think about is what’s the size of an actual work location pool you’re going to start with? It might be more efficient just to start with a long list of the places nearby, within a radius. If you’re dealing with a small pool of work locations, you might not even need the filters to start. Jeff: I agree with that. I do think one other thing that filters are good for is helping us make trade-offs for a service like this. You may say: I want wi-fi or it’s not important, I need a power outlet or not. For a lot of people, if the problem is “I just need a place to work,” then it’s not about filtering. You may just show all the information in the list view, you’re not really displaying that much now. You have some things like a star rating, which isn’t really telling you a lot. Is it because it has a lot of seating? Good wi-fi? Is it because it’s mostly available? I don’t want to get too technical, but try thinking about taking those filters and bringing the information into the actual list items. Geoff: When it comes to the visual design, you could probably consider thinking through what information you’re surfacing, along the lines of what Jeff brought up. To me, it seems like distance and name are probably the two most important factors that I want to see in a list. Right now, the distance is actually the most reduced of all elements on the page. Paola: Were you thinking that either of these cards would be tappable and would lead you somewhere else? Jon: No, I think tapping would lead you to a page that just contains more information, some pictures, at the bottom they would have a “go” button that would just bring up Google Maps and bring you directions to get there. I do 100% agree with what you all have said, which is to bring the information up to the forefront. When you mentioned that I started imagining a design where it still maintains this kind of blocky design, but with the information in the card and a tiny block with the picture and making that more narrow so options can be seen quickly. Rather than having more information when you select it, one click could just bring you to the map. It reduces the friction here as well. Paola: Always go back to your original problem statement so you can verify that everything you’re going to release is actually meeting and solving that problem. For example, if you’re considering keeping a search bar, and the original intent is for people new to an area, then what exactly would you be searching for? If you’re new to a place, you’d likely be searching not for the name of a place, but for a type of place—a book store versus a cafe. Jasmine: I agree, what makes this different from Yelp? Right now you’re getting a lot of the same things. Geoff: That’s a really good thing to think about: the competition. How is this different? How are the needs of my users different and what can I do to help them that’s going to assess some of those needs? For example, most photos on Yelp are going to be of the food. For this, people don’t care about that— they want to see the work space, they want to see where the outlets are, they want to know how good the wifi is, what times of day are busy, how many seats there are. Think about all the things that you’re going to be considering and then, again, how they play into your information hierarchy. Jon: Ok! I have a question now, with all these different aspects to consider, how do you recommend selecting which ones are to be at the top of the hierarchy? How many should be displayed in such a short amount of space? Jasmine: I think Jeff had a good thought around that. You literally go through and try to identify what are the core pieces of information that are important to a user and then list those out and put them in a logical format. Geoff: Yeah, I think for something like this you can use your gut a little bit, or you can talk to other people. One thing that can really help is to think about not just yourself in a certain scenario but yourself in many different scenarios. If you’re jammed on time and it’s 11:00 PM, what do you need to know? Is this place even open that late? You wouldn’t think about that if it’s noon. Think about different contexts and rank those to consider all the information you’d need and when it’s most important. Paola: As long as you try to solve the core problem for each of these contexts to try to make conscious decisions about why you’re solving them. Jasmine: It’s okay if you’re looking through your list of things—like I’m looking at your brainstorm again—and saying: “this doesn’t apply.” Getting rid of options can make your job easier. Maybe food doesn’t even matter in this, maybe you could actually be looking for locations that specifically aren’t restaurants. Tanner: We’re just about out of time, does anyone have anything to say in closing? Nathan: You asked for feedback on visual design and we gave you product critique. I think there’s a lot of things we probably could have gone through with a red marker and give you feedback on. One tactical thing I would suggest is to go out and find articles on UI design. Things like “12 hot tips” that will help you deal with things like list lock-ups, margins, and how to overlay text on images. Those are good starting points as you experiment. Beg, borrow, and steal if you see something in another app or service, try to reproduce it and see how it works for you. Jon: Right, okay. Since we’re on this topic, I wanted to hear from people working in the industry: what is your opinion on how important someone’s visual design skills are when trying to enter into user experience work? Jasmine: You could get a lot of answers on that, it really depends on what role you’re looking for and how important that is versus other factors. One of the reasons we went and did more of a product critique for this is because you can have the best looking app, but if it doesn’t work, no one is going to use it. Those things really going hand in hand. Tanner: All right, hopefully that was helpful. We went over a lot of stuff here. Do you feel like you have a good sense of what you would do next with this product based on our feedback, Jon? Jon: Definitely. I think the first part is like you mentioned: going back to the beginning and focusing on my problem and just knocking out what I need or don’t need then working from there. Finding that hierarchy. Thank you so much, I really appreciate this. Tanner: Thank you for sharing your work in such a public forum. We’re going to learn from this too. Critique can be a great place to develop a deeper understanding of the problem landscape. Context up-front makes a world of a difference when it comes to presenting your work for critique. Jon came to our critique with a clear story of how he landed on the concepts for Nearspace that he had. Being able to briefly show our team his original comps as well as more polished versions, in addition to a brainstorm cloud, helped guide the discussion. 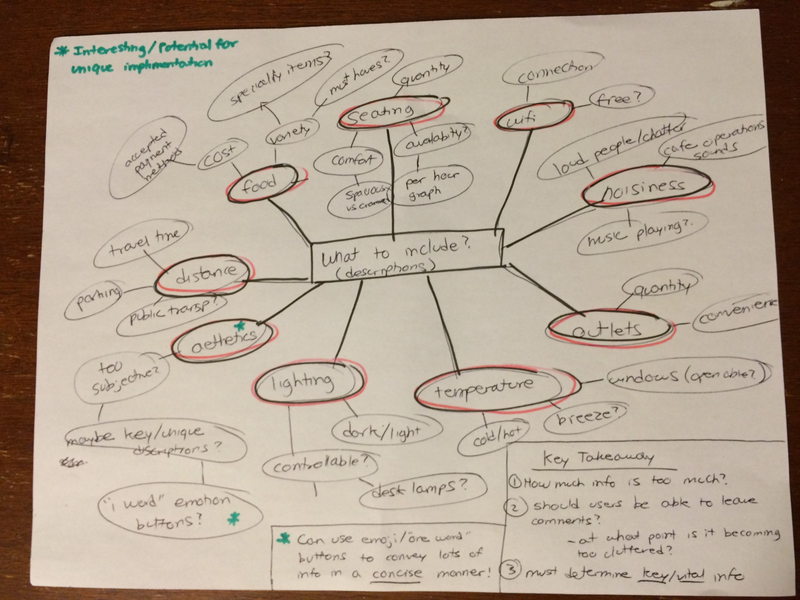 In several instances we referred back to Jon’s original problem statement and brainstorm doodle when addressing a question related to the problem he was attempting to solve. The best feedback is inquisitive, not prescriptive. By asking questions about the design direction—and the problem being solved—the conversation was able to go where it needed to, rather than where any one person felt it should go. The result? Both Jon and the group felt like they had landed on an improved vision of where the product could go, despite the fact there was no concrete “vision” of what that experience might look like. Getting the right questions out is vastly more effective than trying to find the right answer. At Facebook, we know that critiques work best in person, and that transcribing a critique isn’t the best way to share how it went. We’re considering this the first of (hopefully) many open critiques. As such, we’re viewing it as an experiment. If you found this helpful and want to participate in future critiques, leave your feedback on this post or write your own response and we’ll take a look. You can also continue submitting work for us to review on Medium by tagging it with the hashtag: #FacebookDesignCrit. Thanks to Jeff Smith, Nathan Garvie, Jonathon Colman, Jasmine Friedl, and Geoff Teehan. Product Designer @Lyft. Previously Atlassian and Facebook. Author, developer.